Fireplaces: Sustainable or Environmentally Detrimental? Americans have always loved their fireplaces. The theme of cozying up with a blanket and a book – or perhaps a loved one and a glass of wine – next to the warmth of a burning log and the smell of smoldering pine has graced magazine covers and impacted real estate costs. But as more information about the harmful pollutants emitted from wood burning comes to light, the regard people once had for their wood-burning stove has cooled. While the smell and feeling that a fireplace brings to a home can be wonderful, the consequences to your family and the environment can be detrimental. In fact, wood smoke contains many of the same harmful ingredients as cigarette smoke, and can be particularly dangerous to those with asthma, congestive heart failure, angina, pulmonary disease, and emphysema. Wood smoke contains carbon monoxide as well as smog-causing oxides, soot, and a range of other harmful chemicals and gases that can worsen people’s health. Wood smoke is particularly dangerous for pregnant women and children. Fireplaces aren’t just bad for your health, though. Many cities and municipalities have placed restrictions on fireplaces due to their detrimental ecological and environmental impact. Not only is forest harvesting an environmentally destructive habit, but wood burning also puts carbon back into the atmosphere. For every 1000 grams of wood burnt, about 2000 grams of carbon dioxide is emitted into the atmosphere, a process that contributes to global warming. 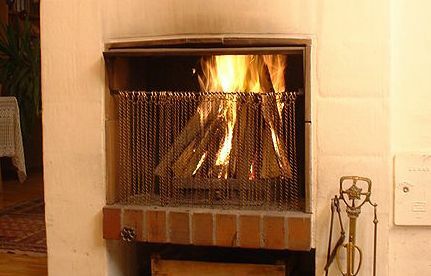 The United States Environmental Protection Agency advocates replacing wood burning stoves and fireplaces in homes, particularly those manufactured prior to 1991. Replacing an old fireplace or stove with a new, energy-efficient model can save money and fuel, while protecting you and your family’s health and safety. The EPA also notes that replacing old fireplaces and wood burning stoves can save 50% more energy, use 1/3 less wood for the same amount of heat production, cut creosote buildup (which can cause fires in chimneys), produce 70% less particle pollution than older models, save billions in health care costs each year, and reduce C02, methane, and black carbon emissions. Some alternatives to the traditional wood burning stove and fireplace include burning wood pellets instead of logs – which burn efficiently and nearly completely – in an effort to reduce pollutants. You can also opt for a gas insert, which burns either liquid propane or natural gas. You might consider replacing your wood burning stove or fireplace with newer models, ranging from gas burning stoves to high-tech, EPA certified, wood stoves. If you’re not willing to switch to gas, an energy-efficient wood burning stove, or burning wood pellets, you can still work to reduce carbon emissions and harmful toxins while still using your fireplace. Simply make sure to get your fireplace checked regularly for back drafts, leaks, or cracks. Also make sure that your chimney isn’t backed up, which can increase indoor air pollution. Be sure to sweep your chimney every few years. Charity Bailey, environmental studies major and friend to the earth. If you’re searching for the best Texas electric company to keep your house warm in the colder months, Charity recommends doing your research and consider all their practices and prices.